Every once in a while, just when things are looking their bleakest, something good emerges. Not always, mind you, but sometimes. Usually, there is at least a chance that the tide can be turned. For example, take a look at this cartoon. This is not a good situation, not for anyone on that bridge. But think how well it turned out for the diver. That guy was stoked. Good came out of bad. The other day, I climbed into our canoe to retrieve a ball that had fallen in the water. It was going to be a short trip, in and out in five minutes. At minute two the boat tipped and I fell overboard. So did the smart phone that was in my pocket, which is why I drew this cartoon last week. The phone was dead, of course, and suddenly I was out of the matrix. I did not know what was happening at the office, or at home. If someone had sent me an email, I would not have received it. If I had run out of gas I would have had to actually walk to a filling station, since I couldn’t call anyone. If zombies had invaded America, I would have been a goner. But as I walked to a meeting, I began to observe things that had been missed before, due to my face being constantly buried in eight square inches of plastic electronics. The weather was nice. There was a gentle breeze blowing that felt good on my face. Old buildings that I had not noticed before revealed intricate designs and styling that someone had thoughtfully inserted many years ago. That was good. So was the new and improved replacement phone I picked up. I could talk to it and it would give me directions, definitions, weather…you name it. It will recognize my thumbprint and tell me when I have a meeting. 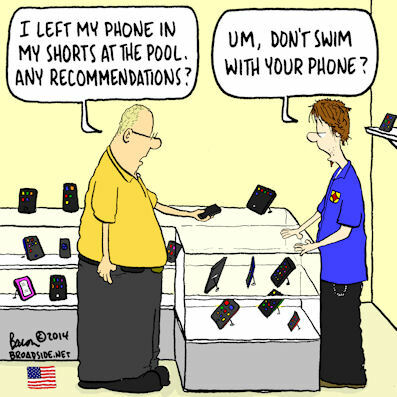 It is one smart phone, and it was definitely better than the old (wet) one. Good from bad. It is nice when things work out that way. It is nice to know that even when things are not going well, there is a chance that conditions will change. That breeds character traits like courage, optimism and hope. That chance is what keeps people moving forward when confronted with obstacles or challenges. One of the top civilian stunt pilots in the world is Sean Tucker, who flies for Team Oracle. He once said that if something catastrophic happens to your airplane and you can’t get out, “keep flying all the way to the ground.” In other words, don’t give up. Keep trying because there is a chance you can figure out how to get down safely. That philosophy works for those of us on the ground too. On the other hand, things can go in the other direction too. Good ideas can turn out badly, even when they seemed pretty solid at the time. So I guess it is all a game of chance.